VIZIM, the first private Health care centre with tradition and reputation we are proud of, has the opportunity and pleasure to present itself to you. 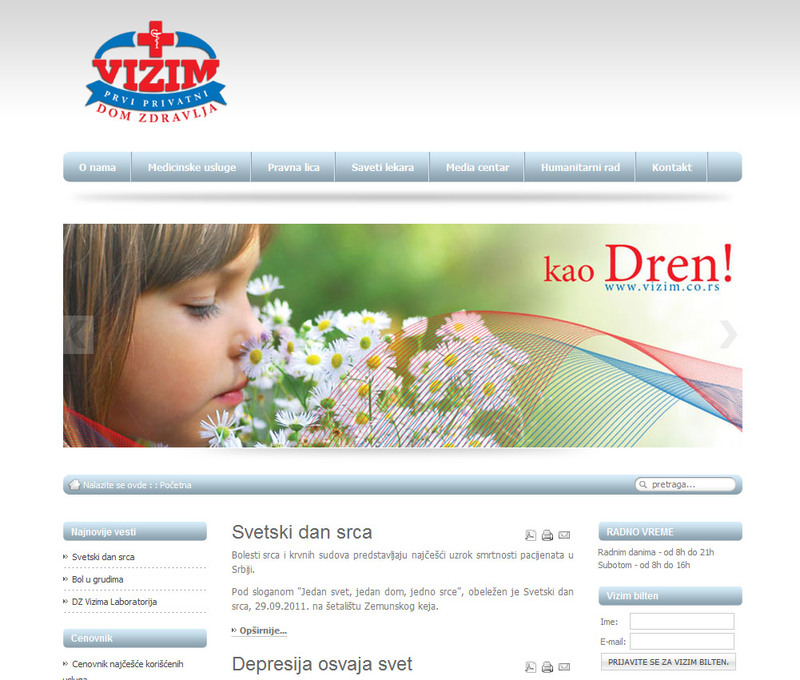 Health care centre VIZIM is situated in the very city centre, beneath Skadarlija Street. It grew up into Health care centre after 13 years of successful work as VIZIM policlinic, and has its outpatients’ facilities in the building of National Theatre, where is taking care of all 3 ensembles (opera , ballet, drama). Health care centre VIZIM’s team has 50 doctors and other medical staff. Working area of the Health care centre consist of specialist services, ultrasound Doppler cabinet, cardiology cabinet (including ergometer, computerized spyrometer, 24 hour halter ECG and TA, echocardiography and heart Doppler), EEG brain diagnostics, gynecology with colposcopy, physical medicine with hydro and laser and magnetic kinesis therapy, therapy with bio currents, ultrasound, pediatrics, ophthalmology, dermatology, dentist, occupational medicine, as well as bio-chemical laboratory. Field service of the VIZIM Health care centre is equipped with ECG, ultrasound and computerized laboratory device for field work. Doctors from our Health House are constantly working on their professional development, as well on scientific researches; they have been rewarded on many local and international congresses. We are also proud that Health care centre VIZIM is a platform for scientific and training process of Organizational Faculty in Belgrade. There is a new toy, be the first to own it!